(New Delhi, Jan 21,2019):The full dress rehearsal for the Republic Day Parade Celebrations-2019 will be held on Wednesday, police said. According to an advisory released by the Delhi Police, the rehearsal will have the same route as that of the Parade on Republic Day on January 26. It will start at 9.50 am from Vijay Chowk and will proceed to the Red Fort. There would be elaborate traffic arrangements and restrictions in place for smooth conduct of the Parade along the route. In order to facilitate smooth passage of the Parade, movement of traffic on certain roads leading to the route of the Parade will be restricted, the advisory said. 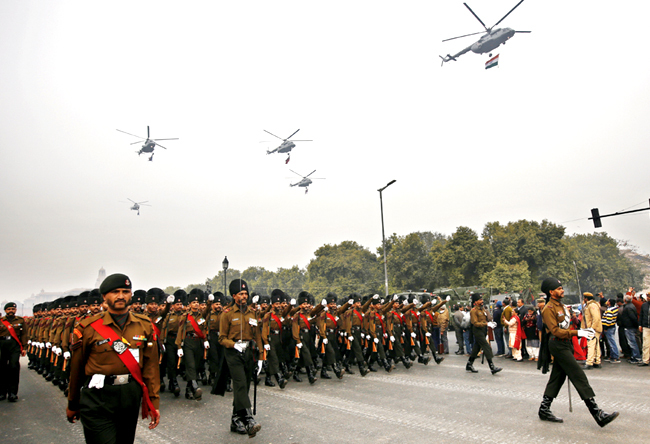 No traffic will be allowed on Rajpath from Vijay Chowk to India Gate from 6 pm on Tuesday till the Parade is over. There will be no cross traffic on Rajpath from 11 pm on Tuesday at Rafi Marg, Janpath, Man Singh Road till the Parade is over. C-Hexagon-India Gate will be closed for traffic from 9 am on Wednesday till the Parade crosses Tilak Marg and from 10 am on Wednesday traffic on Tilak Marg, BSZ Marg and Subhash Marg will not be allowed on both directions. Cross Traffic will only be allowed depending upon the movement of the Parade, the advisory stated. People are requested to plan their journey in advance accordingly and avoid the route of the Parade from 9 am to 12.30 pm. Metro services will be available for commuters at all stations on Wednesday, but there will be no boarding and de-boarding at Central Secretariat and Udyog Bhawan Metro Stations from 5 am till 12 pm, the advisory said. No light goods and heavy transport vehicles will be allowed to enter Delhi from borders from 10 pm on Tuesday till the Parade is over. No light goods and heavy transport vehicles will be allowed to ply between ISBT Sarai kale Khan and ISBT Kashmiri Gate on Ring Road from 7.30 am to 1.30 pm on Wednesday, the advisory added.